SNES Majyuuou (JPN) "best ending" in 16:13.4 by Samsara. 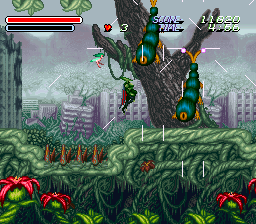 Majyuuou is a side-scrolling platformer for the Super Nintendo, taking influences from Castlevania and Contra. You play as Abel, intent on rescuing his daughter from the depths of Hell. As you defeat certain bosses, they will drop large, color changing gems. Pick up the gem, and you'll transform into either a red Harpy, a blue Dragon, or a green Lizard, depending on what color it is when you pick it up. Each demon type has its own special attacks. This run aims for the game's True Ending, which requires unlocking and using the Black form in Stage 6. To unlock the Black form, you need to use a unique form for every stage before Stage 6. Any combination of Red, Green and Blue will do, as long as you use all three of them.